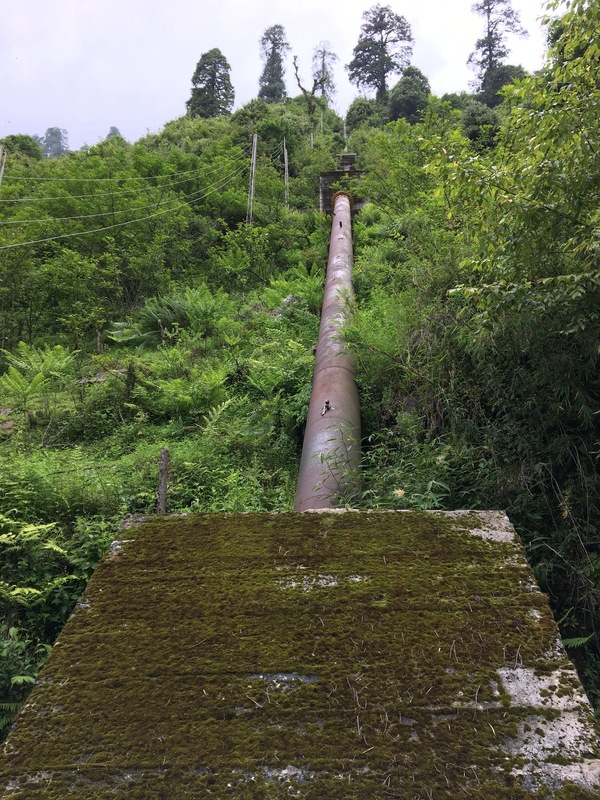 The project envisages construction of a trench weir across Sorang Khad to divert 17.34 cumecs flow (2 units) into a water conductor system comprising Head Race Tunnel of size 3.2m x 4.0m, D-shaped and 1.45km long; Surge Shaft of 6.5m dia and 56.1m high; Surface Penstock of 3.25m dia and about 826m long followed by a steel lined Pressure Shaft of about 287m long and an underground Power House of size 79m (L) x 16.5m (W) x 39.5m (H) housing total three (presently two) generating units of Pelton Turbines. The flow after generation shall be diverted into River Sutluj through a 4.5x5.0 m D-shaped, 166 m long tail race tunnel. AEMPL engaged to provide Engineering Consultancy Services for the Review of the Detailed Feasibility Study and Supervision of the Construction of Ayago Hydro Power Project and its associated Transmission Interconnection. 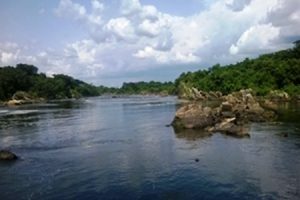 Ayago Hydro Electric Project has been contemplated as a run of the river scheme situated in the Murchison Falls National Park District of Uganda. The Diversion Dam is located across Nile River. The Project would utilize a head of 80 m and design discharge of 938 Cumecs for generation of 840 MW. The Project comprises of 24 m high Concrete Gravity dam, 6 Nos. of intake on left bank of Nile River feeding 6 Nos. of 6.6 m circular shaped pressure shaft, underground power house housing 6 units of 113.33 MW and 3 Nos. of 13 (W) x 15 (H) m D-shaped, 7.2 km long Tail Race Tunnel. Aquagreen Engineering Management Pvt. Ltd. (AEMPL) providing the Engineering Consultancy Services for effective operation of plant including monitoring and post construction maintenance activities. A 45 m high concrete gravity dam of length 213 m including 63 m of key wall in the left bank. 6 m diameter circular simple type surge shaft of 80 m height. A 2.5 m pressures shaft of length 758.60 m which includes top horizontal, vertical and bottom horizontal segments. An underground power house housing 2 nos. of vertical axis Pelton turbines measuring 67.5 m (l) x 17.5 m (w) x 35.85 m (h). A 5.4 m x 6.75 m D-shaped tail race tunnel of length 380 m.
The project utilizes a gross head of 602 m and design discharge of 20 cumecs to generate 409 MU of energy in 90 % dependable year. 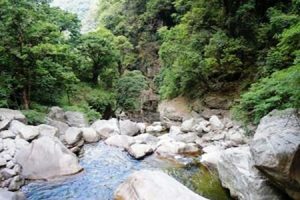 The Project is a high head, run-of-river project with 4 hour pondage and is located on Malana Khad, a tributary of the Parbati River, Himachal Pradesh. The Commercial Operation Date (COD) of the project was declared on 12th July 2012. AEMPL has involved in the preparation of post construction activities and monitoring which are required for effective operation. CLIENT: Athena Kynshi Power Pvt. Ltd.
AEMPL engaged to provide Engineering Consultancy Services for Preparation of Pre-feasibility Report (PFR), Detailed Project Report (DPR), Tender Design and assistance in award of EPC Contract for 270 MW Kynshi – I HE Project, Meghalaya. 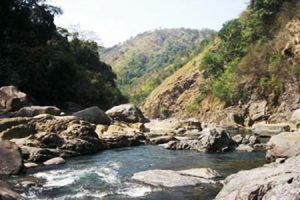 Kynshi – I Hydro Electric Project has been contemplated as a run of the river scheme situated in the West Khasi Hills district of Meghalaya. 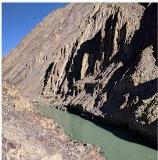 The Dam site is located on River Kynshi, D/s of confluence of Umkyrtha River with Kynshi River. The Project will utilize a gross head of 581.00 m and design discharge of 54.86 cumecs for generation of 270MW. The Project comprises a 58.10 m high Concrete Gravity dam, two de-silting basins of 12 m X 21.5 m X 200 m; 6.89 km long 4.5 m diameter HRT, 67.5 m high 8.5 m diameter surge shaft, 1855 m long & 3.6 m diameter pressure tunnel including horizontal & vertical shaft. An underground power house housing 2 units of 135 MW. A 2.5 km long 5.25 m diameter tunnel conveys back the water back to River Kynshi after power generation. Design Energy is 1067 MU in 90% dependable year. 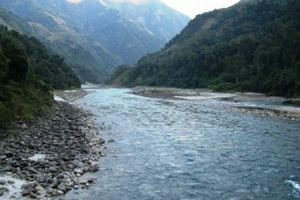 Teesta – III Hydro Electric Project has been contemplated as a run of the river scheme situated in the North Sikkim district of Sikkim. 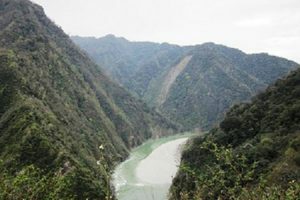 The Dam site is located on River Teesta just d/s of confluence of River Laching Chu and Lachung Chu. The Project will utilize a gross head of 817 m and design discharge of 175 cumecs for generation of 1200 MW. 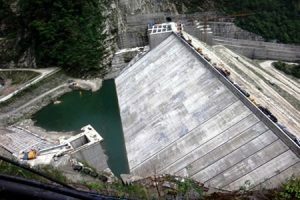 The Project comprises a 60 m high Concrete Faced Rockfill Dam, two de-silting basins of 17m X 23m X 320m; 14.3km long 7.5m diameter HRT, 15.5 m diameter circular surge shaft of 160m height, 1806.67m long & 2 nos. of 4m diameter pressure tunnels including vertical shaft and inclined shaft of length about 1650 m. An underground power house housing 6 units of 200 MW. A 1.2 km long 8.2x8.0 m tunnel conveys back the water back to River Teesta after power generation. The following works have been completed by M/s Aquagreen Engineering Management Private Limited for the Review Engineering during Construction Stage (2008-2010). To study and evaluate the construction design/ drawing from the point of view of construction suitability to site condition. Review the works under execution with the objective to achieve the scheduled progress. Review the implementation of QA/ QC program implemented by the contractor and engineering agency. Construction supervision services on behalf of WAPCOS during execution of the Project including supervising construction, equipment installation and commissioning with a supervision team, undertaking quality assurance on the site and ,oversee the contractors' quality control systems, provide expertise as needed on site on a case by case basis. Review the Construction & Equipment Planning. CLIENT: Andra Power Pvt. Ltd.
AEMPL engaged to provide Engineering Consultancy Services for preparation of Pre-feasibility Report (PFR), Detailed Project Report (DPR), Preparation Tender Documents of 1000 MW Naba Hydroelectric Project, Arunachal Pradesh and obtaining approval from statutory authorities. Naba H.E. 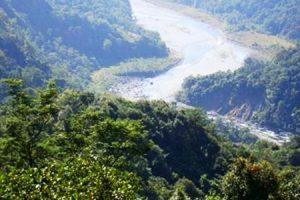 Project is located in upper reaches of Subansiri River, Arunachal Pradesh. The average river bed level at the dam site is about 870 m and FRL at the dam has been proposed at EL.1035 m. The Project will utilize a gross head of 245 m and design discharge of 468.22 cumecs for generation of 1000 MW. Naba H.E Project envisages a construction of a 167 m high concrete gravity dam with 2 Nos. of 11 m diameter diversion tunnels as diversion structure, 2 Nos. of power intake with trash rack arrangement, 2 Nos. of 3.1 km & 3.85 km long 8.7 m diameter head race tunnel, 2 Nos. of 23.0 m diameter surge shaft& 85 m high, 2 Nos. of 7.25 m diameter steel lined pressure shaft which include penstock of dia. 5.75 m on bifurcation. Underground power house housing 4 units of 250 MW each. Design Energy is 4249.42 MU in 90% dependable year. AEMPL engaged to provide Engineering Consultancy Services for preparation of Pre-feasibility Report (PFR) of 800 MW NiareHE Project, Arunachal Pradesh and obtaining approval from statutory authorities. Niare H.E. 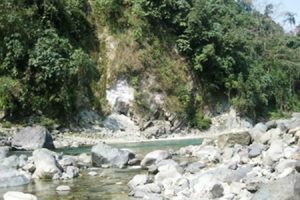 Project is located in upper reaches of Subansiri River, Arunachal Pradesh. The average river bed level at the dam site is about 1200 m and FRL at the dam has been proposed at EL.1280 m. The Project will utilize a gross head of 228 m and design discharge of 407.50Cumecs for generation of 800 MW. Niare H.E Project envisages of 101.56 m high concrete gravity dam with 2Nos. of11m diameter diversion tunnels as diversion structure, 2Nos of power intake with trash rack arrangement, 2Nos. of 3.14 km&3.10km long 8.50 m diameter head race tunnel, 2Nos. of 20.0 m diameter surge shaft&100m high, 2Nos. of 486.50mlong 7.25 m diameter steel lined pressure shaft which include penstock of dia. 5.50m on bifurcation. Underground power house housing4 units of 200 MW each. Design Energy is 3647.39MU in 90% dependable year. CLIENT: Arista Power Pvt. Ltd.
AEMPL engaged to provide Engineering Consultancy Services for preparation of Pre-feasibility Report (PFR) of 520 MW Dengser Hydro Electric Project, Arunachal Pradesh and obtaining approval from statutory authorities. 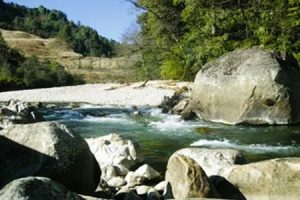 Dengser Hydro Electric Project is located in upper reaches of Subansiri River, Arunachal Pradesh. The average river bed level at the dam site is about EL. 531 m and FRL at the dam has been proposed at EL. 620 m. The Project will utilize a gross head of 126.63 m and design discharge of 470.90 cumecs for generation of 520 MW. Dengser H.E Project envisages of 121.19 m high concrete gravity dam with 2 Nos. of 11 m diameter diversion tunnels as diversion structure, 2Nos of power intake with trash rack arrangement, 2 Nos. of 5.11 km & 4.96 km long 9.20 m diameter head race tunnel, 2 Nos. of 25.0 m diameter surge shaft & 50 m high & 2 Nos. of 8.10 m diameter steel lined pressure shaft each of 324 m & 264 m in length which include penstock of dia. 4.57 m on bifurcation. Underground power house housing4 units of 130 MW each. Design Energy is 1986.92 MU in 90% dependable year. CLIENT: Lohit Urja Power Pvt. Ltd.
AEMPL engaged to provide Engineering Consultancy Services for preparation of Detailed Project Report (DPR), Tender Design and assistance in award of EPC Contract of 270 MW Anjaw HE Project, Arunachal Pradesh. The proposed project site is 335 km away from Dibrugarh which is nearest airport. The barrage site is located upstream of confluence of River Lohit & River Dau and surface Powerhouse is located on right bank of Lohit River at about 70 m downstream of the barrage. The average river bed level at the dam site is about EL 550.00 m and FRL at the dam has been proposed at EL 580.00 m. The project consist of 30.0 m high barrage of length 415 m, 7 nos. of 7 m dia. penstocks of length of about 50 m, surface powerhouse having 7 units of 38.5 MW. The project would generate 1146 MU in 90% dependable year. Aquagreen Engineering Management Private Limited (AEMPL) provided complete Engineering and Project Management Services for all civil works associated with the 81 MW Pemashelpu Hydroelectric Project. The project is a run of river Hydroelectric project on the Yargyap Chu River, a major tributary of Siang River in West Siang District, Arunachal Pradesh. AEMPL was involved in preparation of Pre-feasibility, Feasibility and Detailed Project Report (DPR) which includes civil, hydro mechanical and electromechanical works and assistance in obtaining clearance from statutory authorities. CLIENT: Athena Demwe Power Pvt. 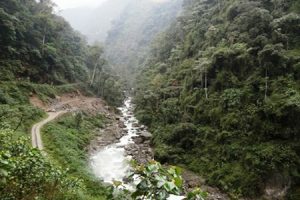 Ltd.
Demwe Lower Hydro Electric Project has been contemplated as a run of the river scheme situated in the Lohit district of Arunachal Pradesh. 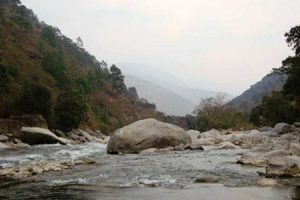 The Dam site is located on River Lohit, upstream of Parasuram Kund. The Project will utilize a gross head of 120.00m and design discharge of 1729 cumecs for generation of 1750 MW. The Project comprises a 165 m high Concrete Gravity dam, five numbers of 10.0 m diameter pressure shafts of 450 to 600 m long. A surface power house housing 5 units of 342 MW each and one 40 MW. Design Energy is 6322 MU in 90% dependable year. AEMPL engaged to provide Engineering Consultancy Services for preparation of Detailed Project Report (DPR), Tender Design and assistance in award of EPC Contract of 1080 MW Demwe Upper HE Project, Arunachal Pradesh. 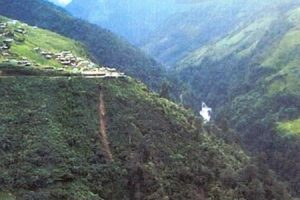 Demwe Upper HE Project is located in Anjaw District of Arunachal Pradesh on Lohit river. The proposed project site is 80 km away from Tezu which is District HQ of Lohit. The Dam site is located about 12.8 km downstream of confluence of Dalai River and underground Powerhouse is located on right bank of Lohit River at 150 m downstream of the dam axis. The average river bed level at the dam site is about EL 440.00 m and FRL at the dam has been proposed at EL 525.00 m. The project consist of 131.0 m high composite dam, 5 nos. of 10.0 m dia. pressure shaft length varies from 150.0 m to 285.0 m, an underground powerhouse having 5 units of 206 MW and 1 unit of 50 MW. The project would generate 3991 MU in 90% dependable year. CLIENT: Yedla Infra Pvt. Ltd.
AEMPL engaged to provide Engineering Consultancy Services for Preparation of Pre-feasibility Report (PFR), Detailed Project Report (DPR) and assistance in obtaining clearance from Statutory Authorities for 67 MW Simang – I HE Project, Arunachal Pradesh. Hydrological studies including water availability, design flood and diversion flood studies by various methods by obtaining data from IMD and CWC etc. Preparation of DPR stage design, drawings and quantity estimation for all the Project components including civil, hydro-mechanical and electro-mechanical works. AEMPL engaged to provide Engineering Consultancy Services for Preparation of Pre-feasibility Report (PFR), Detailed Project Report (DPR) and assistance in obtaining clearance from Statutory Authorities for 66 MW Simang – II HE Project, Arunachal Pradesh. Engineering consultancy for preparation of detailed design and drawings for the construction of river diversion arrangement, Trench weir, intake, HRT and Hydro mechanical equipment. CLIENT: S S Yamne Power Pvt. Ltd.
AEMPL engaged to provide Engineering Consultancy Services for preparation of Pre-feasibility Report (PFR), Detailed Project Report (DPR), Concept to Commissioning Consulting Services of 90MW Yamne – II HE Project, Arunachal Pradesh. Yamne Stage – II H.E. 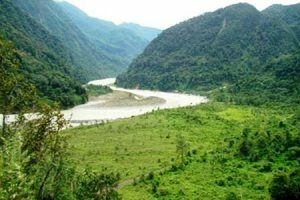 Project is located in the Upper Siang District of Arunachal Pradesh on Yamne river. The average river bed level at the barrage site is about EL. 517 m and FRL at the barrage has been proposed at EL. 536.0 m. The Project will utilize a gross head of 96.0 m and design discharge of 117.32 Cumecs for generation of 90 MW. Yamne – II H.E Project envisages of 22 m high Barrage with diversion tunnel & channel as diversion structure, 20m wide approach channel, 2Nos of De-silting Basin, 1No.of Power Intake with trash rack arrangement, 1No. of 6.5 m diameter head race tunnel&6.34 km long, 1No.of 19.0 m diameter surge shaft&93.80 m high, 1No.of 5.5 m diameter pressure tunnels & 187.21 m long . A Surface power station housing 3 units of 30 MW each. Design Energy is 367.43 MU in 90% dependable year. Yamne Stage – I H.E. 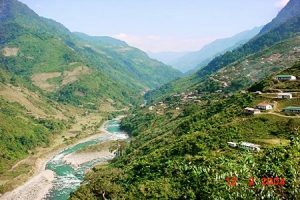 Project is located in the Upper Siang District of Arunachal Pradesh on Yamne river. The average river bed level at the dam site is about El. 690 m and FRL at the dam has been proposed at El. 735.0 m. The Project will utilize a gross head of 170.0m and design discharge of 96.97 cumecs for generation of 135 MW. A Concrete Gravity Dam of 47.0m height and 221.15m length at top has been proposed as diversion structure, 11.20 km long 6.5m diameter HRT, 91.0 m high 15.0 m diameter surge shaft, 709 m long & 5.0 m diameter pressure tunnels including penstock & vertical shaft. A Surface power house housing 3 units of 45 MW each. Design Energy is 602 MU in 90% dependable year. 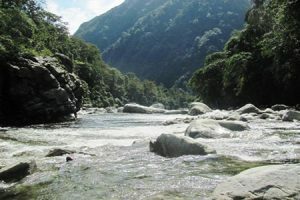 Khuitam Project is located across Gang River, a tributary of Bichom River in West Kameng District of Arunachal Pradesh. The project consists of a 19 m high diversion structure (barrage) about 12.26 km downstream of Rahung village and a Surface Power House site is located upstream of Selari Village with an installed capacity of 3 x 22 MW. AEMPL provided engineering consultancy services for optimum utilization of Emra River and preparation of pre-feasibility report for Emra – II (315MW) HE Project and obtaining approval from statuary authorities. The Project is a run of river/storage type Hydroelectric Project on confluence of Emra & Tangon river in Dibang River, Arunachal Pradesh. AEMPL was involved in preparation of various alternatives at Pre-feasibility stage and from which one alternative is considered which is cost-effective and techno-economically layout. The project consists of gravity dam of height 113 m and of length 256 m across River Subansiri where the river bed elevation is EL. 594 m. The water for power generation is conveyed through a steel pressure shaft of 7 m diameter which further bifurcates to feed the units in the underground power house. 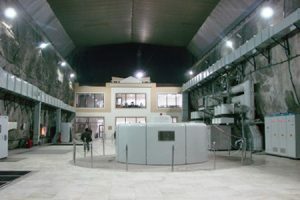 The underground power house is situated in the left bank of River Emra and measures79 m (l) x 14 m (w) x 15.5 m (h). The underground power houses 3 vertical axis Francis turbines to generate 315 MW. The design energy in the calculated to be 1491.59 MU.